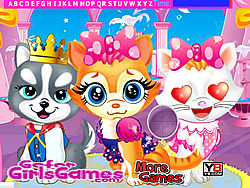 Pets Beauty Salon Hidden Game is for pet lovers. You always like to see your pets look beautiful. Bring your favorite pets to a beauty salon and see its transformation. In this hidden game you have to spot the hidden English Alphabets. Find the hidden letters and click on it. For kids this game playing may help to learn English Alphabets.